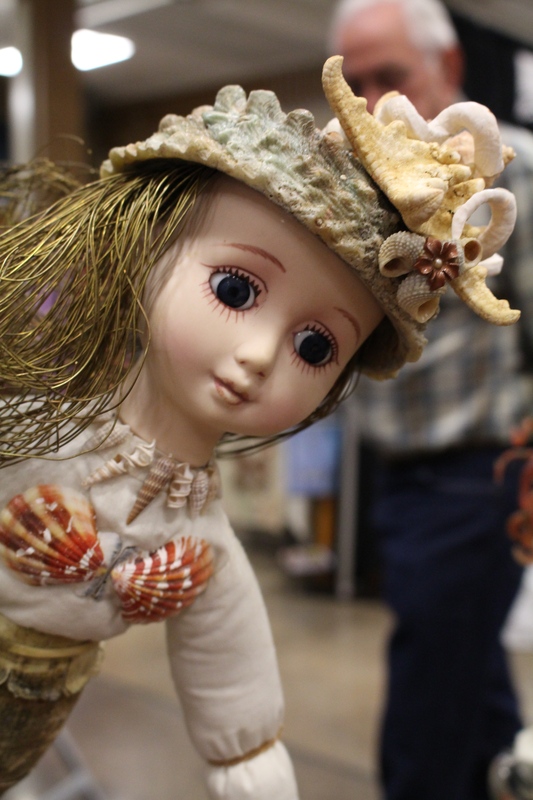 Fine crafts and whimsy, too: Foothills Craft Guild Show | Oh, the Places We See . 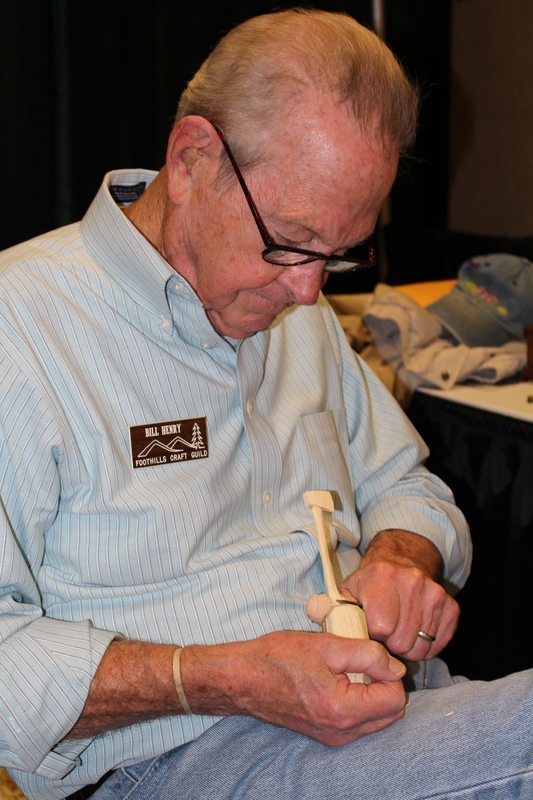 . .
We are publishing this blog post from the 2013 Foothills Craft Guild Show since the 2014 show is coming up soon: November 14-16 at Chilhowee Park, Knoxville, TN. Can’t emphasize enough the quality and uniqueness of the creations for sale by these juried artists! 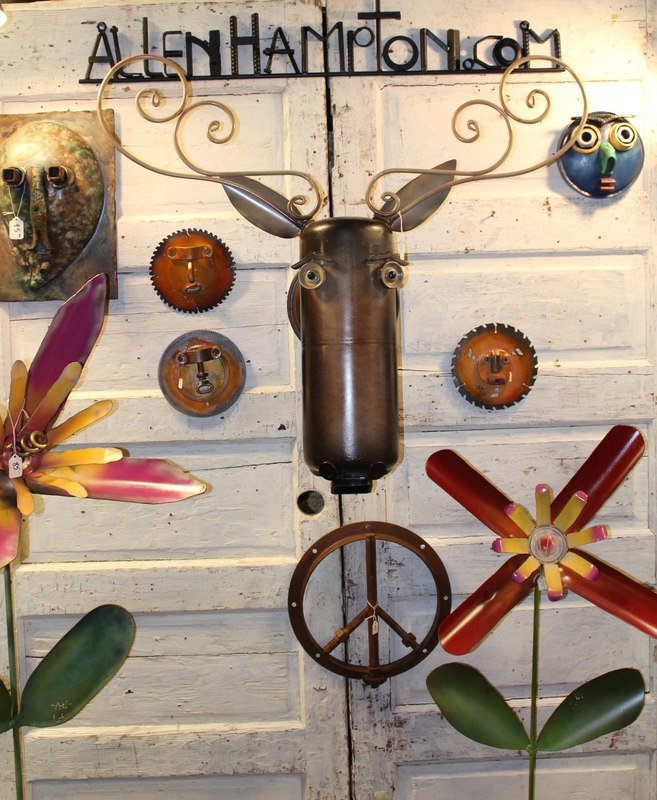 Make time to treat yourself to the area’s finest artists and craftsmen. You’ll be so glad you did. For more information, click here. 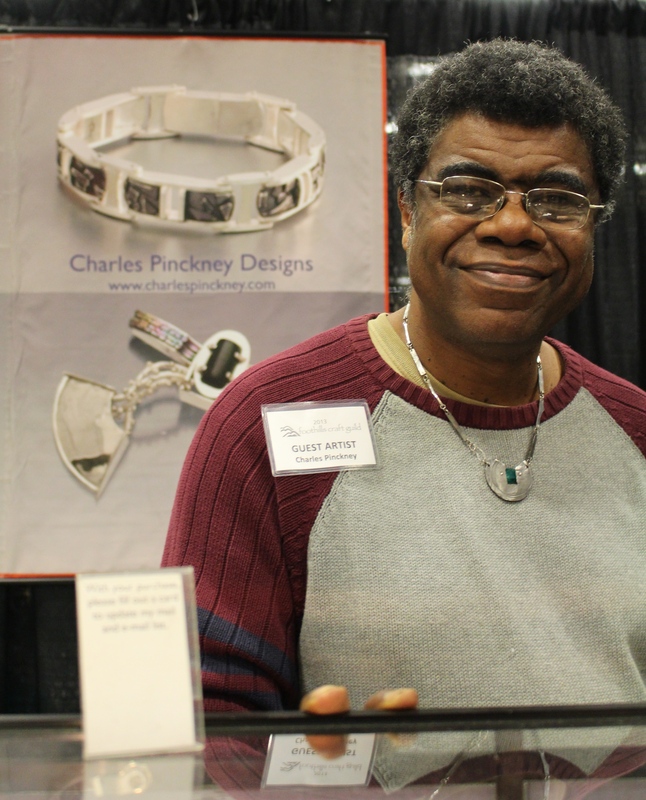 It was mostly what we’ve come to expect from this annual Fine Craft Show in Knoxville by the Foothills Craft Guild: unique, one-of-a-kind, artistically crafted items displayed tastefully by some of the nicest artisans you would ever hope to meet. But this year, the event held November 15-17, offered the unexpected: humor! 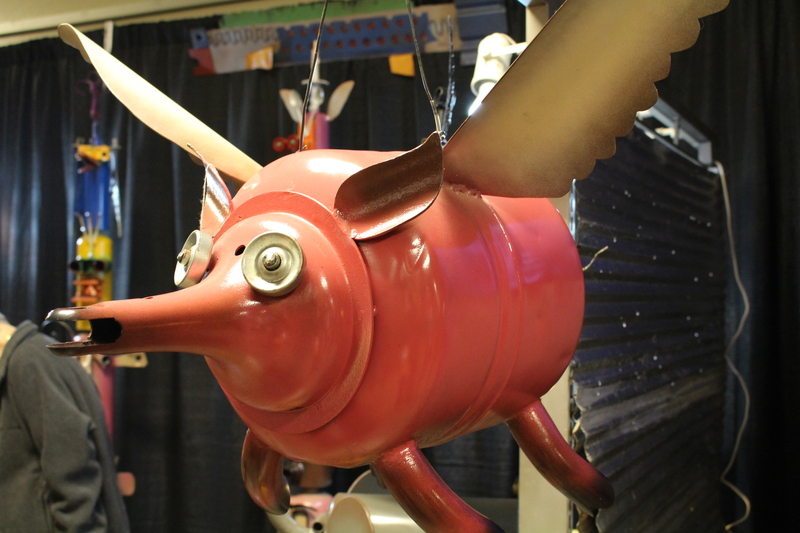 That’s right — many of the artists and craftspeople showcased their whimsical creations much to the delight of the hundreds of patrons and visitors who packed the Jacob Building and gathered ’round the best of the best. Although all — and we mean all — of the booths held quality pieces, we found several artists and creations that spoke to us in new ways. Linda’s finely stitched fabric collages bear looking at closely. 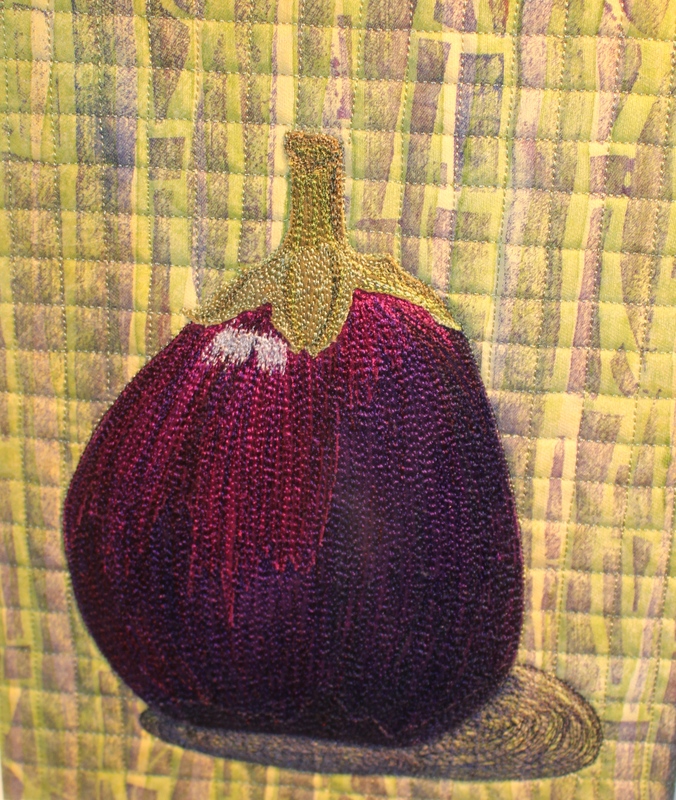 The strength of color and composition are marvels in themselves, but when you get close, you can’t believe the tight rows of tiny stitches that add texture and artistry. 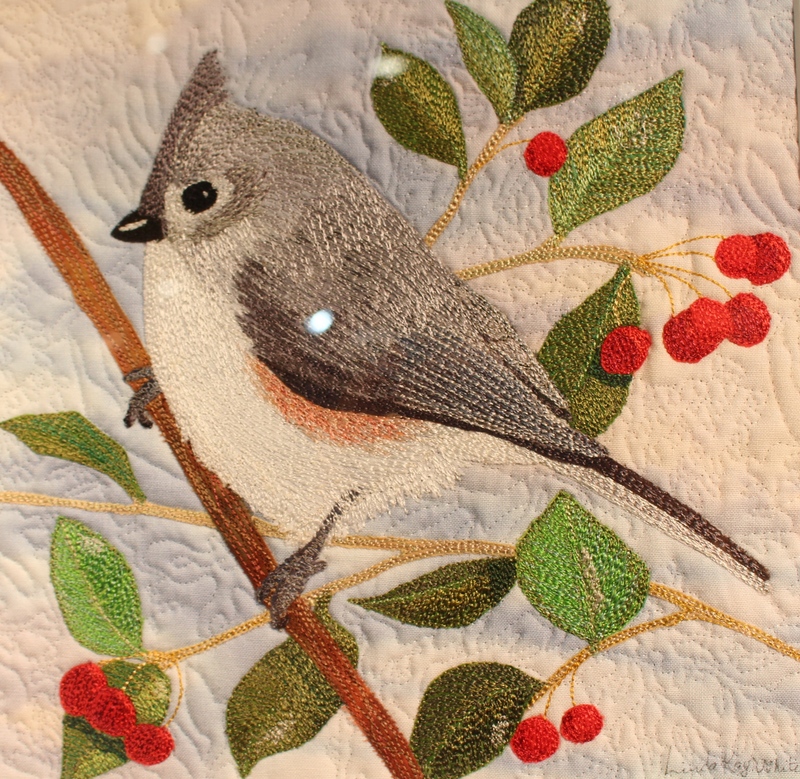 Jeri Landers returned this year with more of her signature scherenschnitte (scissor cuttings). But she was also autographing her illustrated books featuring a rabbit of her own creation: Hopalong Jack — just one of her many endearing woodland animals. Click here for her website featuring more of her work and upcoming projects. 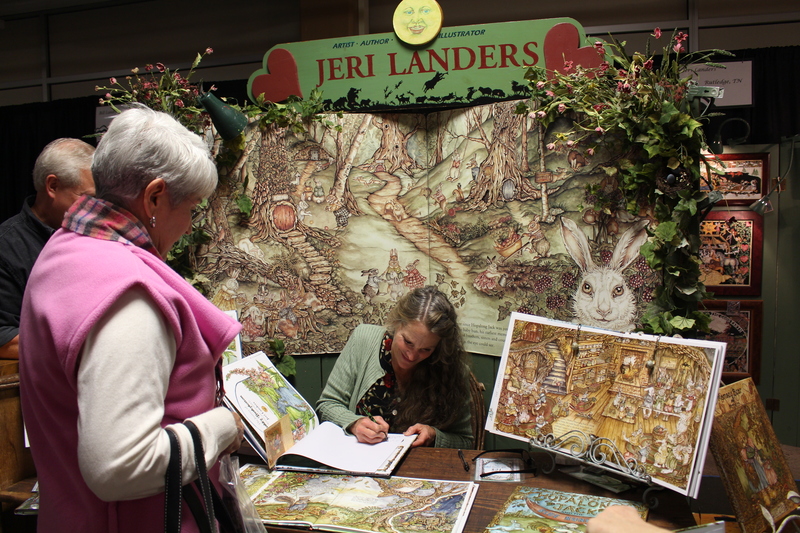 Jeri Landers autographing a book featuring Hopalong Jack. Clay pieces from Mary Curtin generally feature hand-cut flower motifs with delicate openings lending an airiness to the bowls, baskets, and plates she produces. 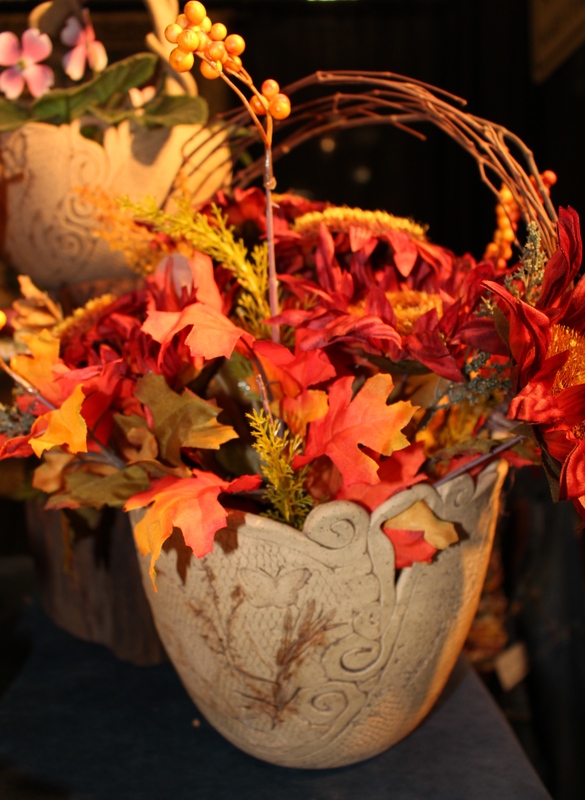 This rich red floral arrangement complemented an earthy clay basket that stood out against the black background of her booth. We couldn’t resist picking up the hand-turned bowls, vessels, and plates by Bob Klassen and learning more about the woods the artist uses for each piece. This is art you want to touch. 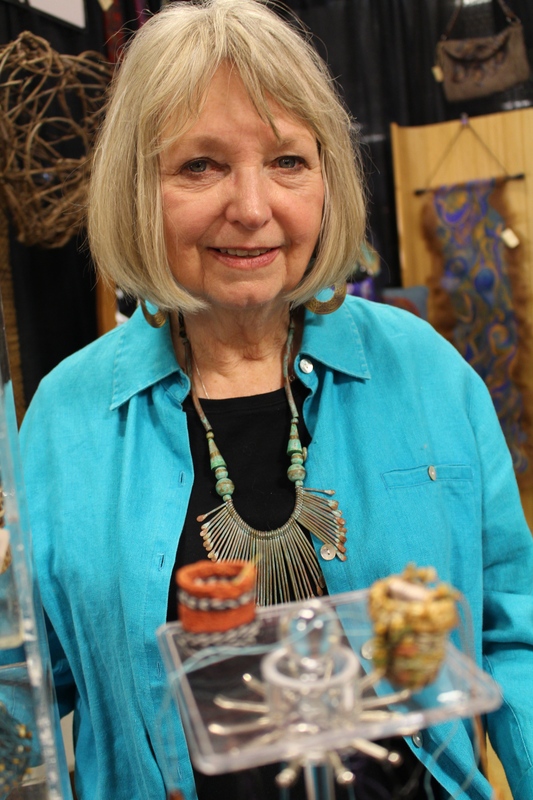 A member of Foothills Craft Guild for many years, Beryl told us that she began her career making gathering baskets, one of her early “loves” and, today, still one of her favorite things to make. 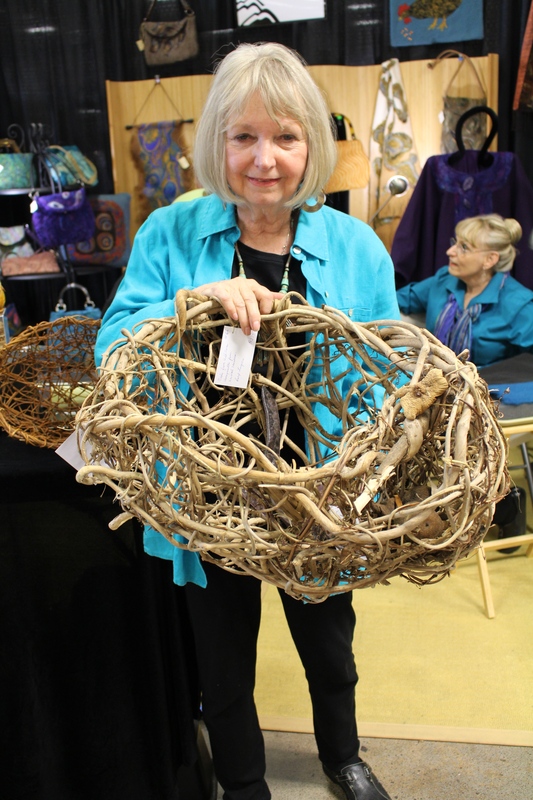 But she also offered something tiny to her fans and patrons: miniature woven baskets — some not any bigger than a thimble — made of string, thread, and natural pieces like bark or feathers. 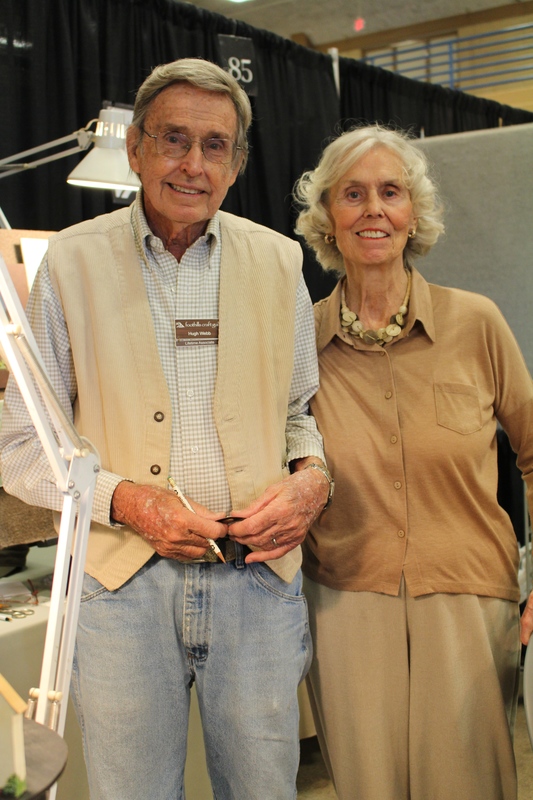 For many years, Hugh and Barbara have brought their tiny hand-cut, hand-painted wooden pins and boxes, but this year the couple branched out with other surfaces like gourds and driftwood. 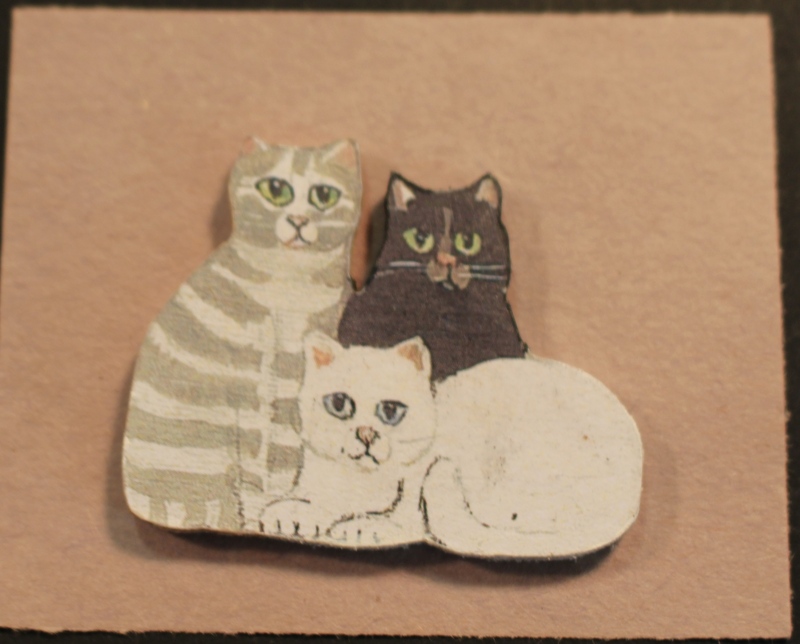 People love to examine the detail on these miniatures and ask them repeatedly, How can you do such tiny work? When we turned the corner of one of the aisles, we spied familiar work — the photography of Clay Thurston — and the first of many pieces for sale that made us smile! We loved a trio of pictures based upon an old pick-up truck bearing trees, etc. But it was Clay’s title that brought it to life: Long Term Parking. Clay brought something new to the show this year: photographs on canvas with the same high quality resolution that we’ve come to expect from him. Beautiful! Wooden spoons and bowls are generally utilitarian pieces — something every kitchen and every chef needs. 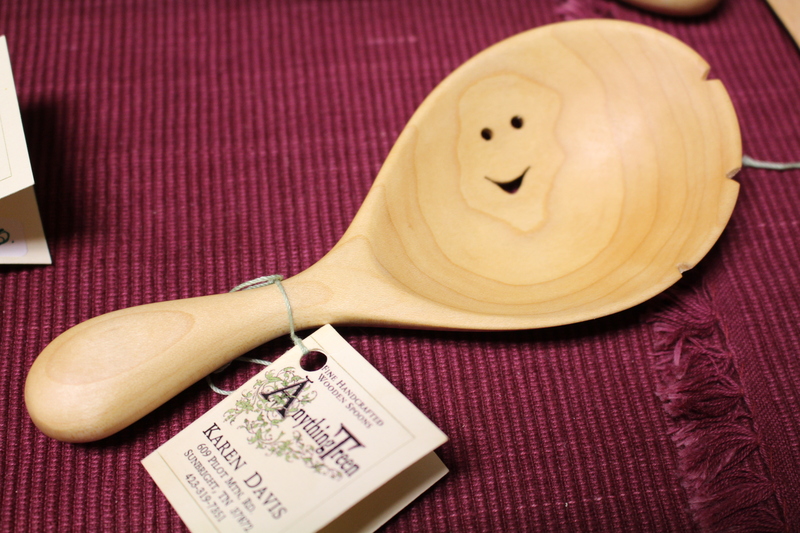 But in Karen Davis‘s hands, even the simplest spoon can be fun. Doesn’t this little smiley face make you want to smile back? 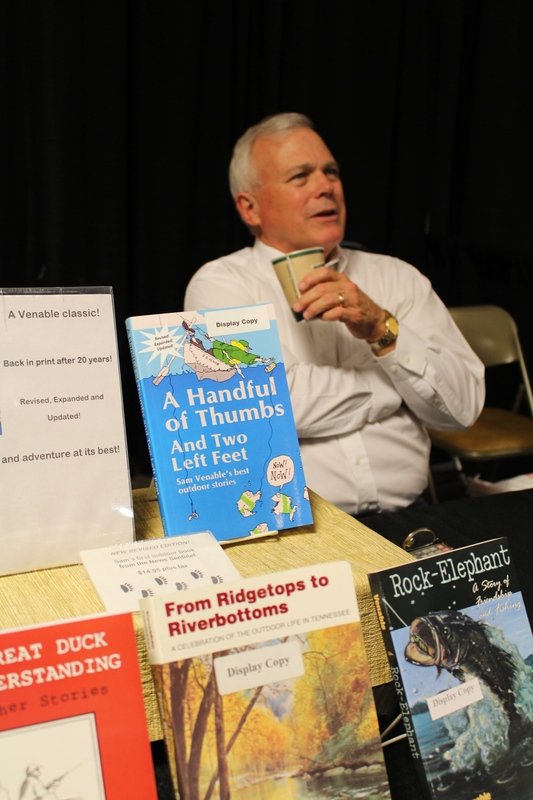 Speaking of smiles, a man who cheers us up with almost every column he writes for the Knoxville News-Sentinel visited with fans and signed his books filled with local color and Southern humor. Sam Venable is known in “these-here” parts as someone who can find humor in just about every phase of life. He even makes writing sound easy — like fallin’ off a log! Bill Landry (WBIR’s Heartland Series host), Jim Johnston (historian) and Dr. Bill Bass (author and noted UT professor) joined Sam in the Author’s Corner, and there’s just no tellin’ what laughs they stirred up! 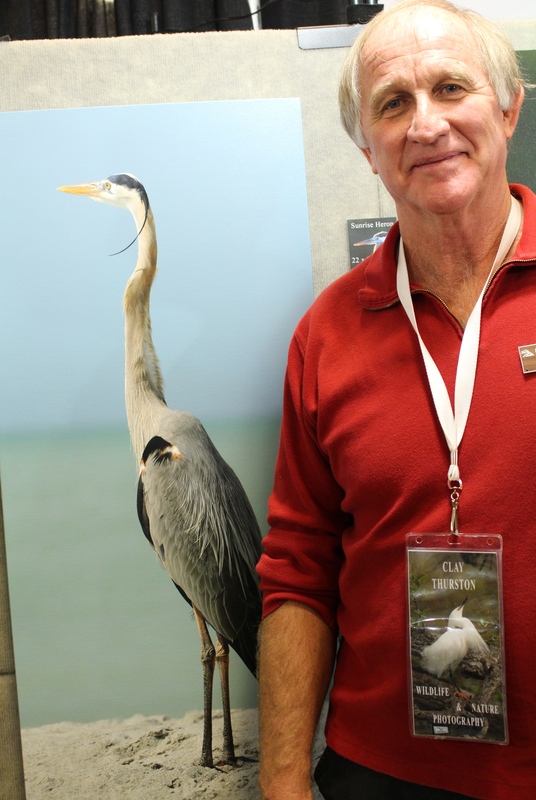 Sam Venable — telling another tall tale? Some of the artists and guild members volunteered to share their secrets right out in front of all of us. 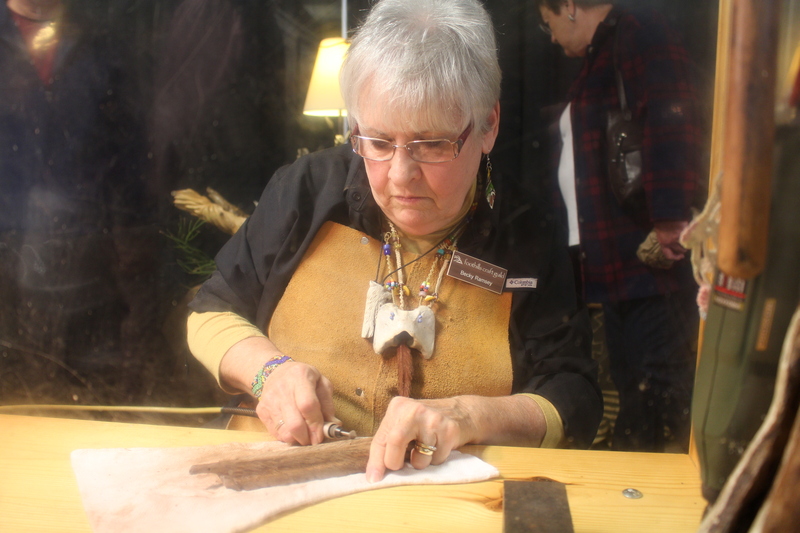 And you could see most visitors smiling and pointing and calling other people over as they watched the craftspeople demonstrate what they do best. In our category of “Most Original” was the work of three artists. 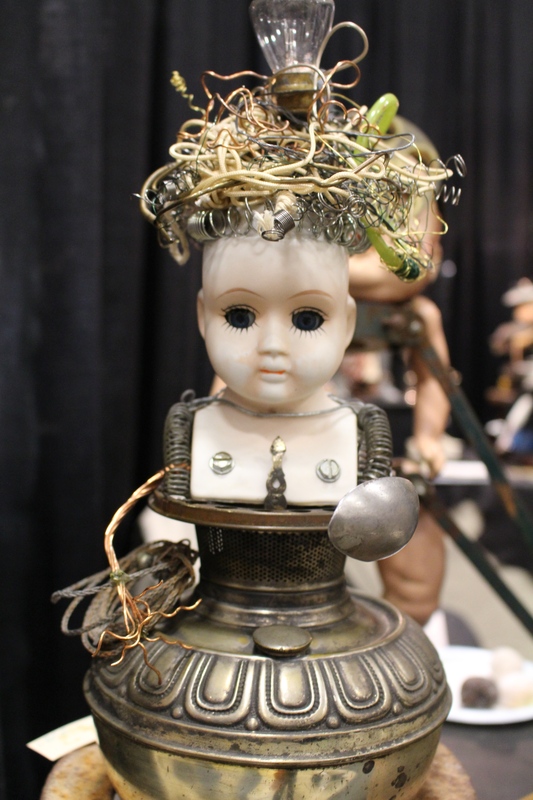 Kitty fashions what she calls Castaway’s Sculpture out of cast-off pieces — like doll heads, seashells, metal parts, and antique toys. Just one look at these examples should make you move closer to your screen to examine the compositions, but if you want to see more, go to Kitty’s website: www. CastawaysSculpture.com. We overheard one lady remark, These ought to be in the The Smithsonian! And maybe someday, they will be! 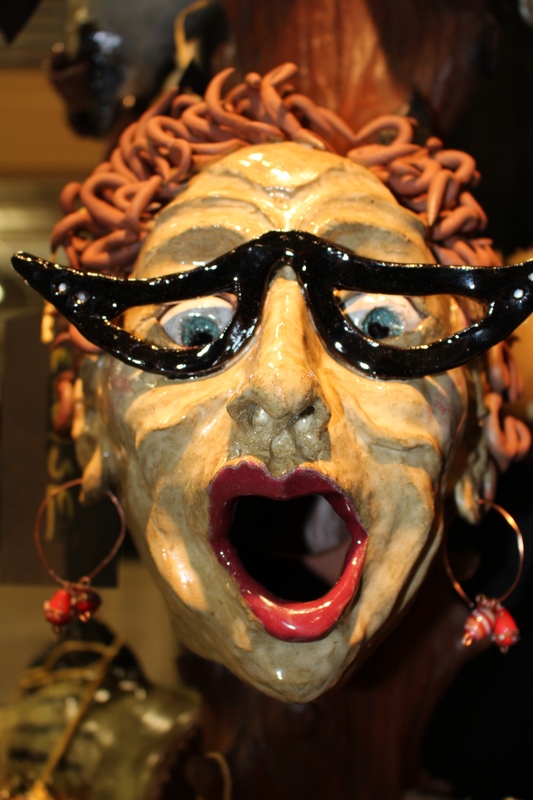 And so, the Fine Craft Show for 2013 wraps up with even better artistry and humor than before. If you missed this year’s event, put it on your calendar for next year. In our East Tennessee region, it’s one of the best (we think!) 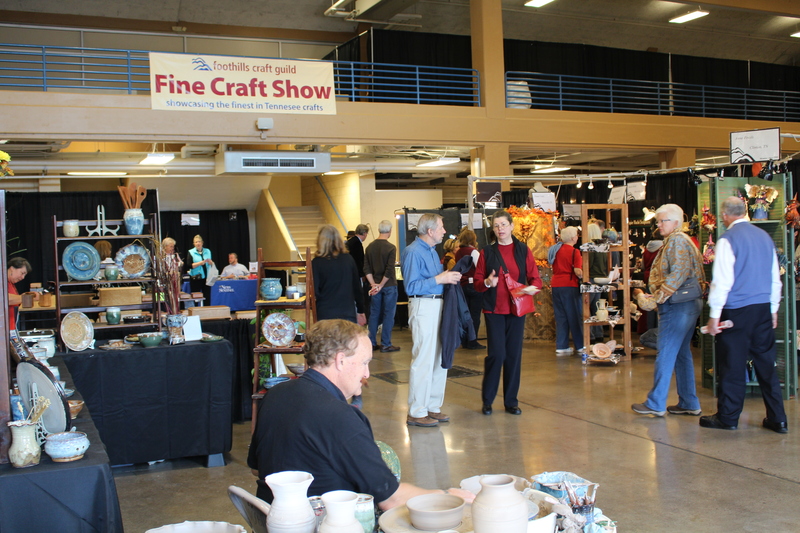 and this year, possibly one of the most whimsical craft shows around! 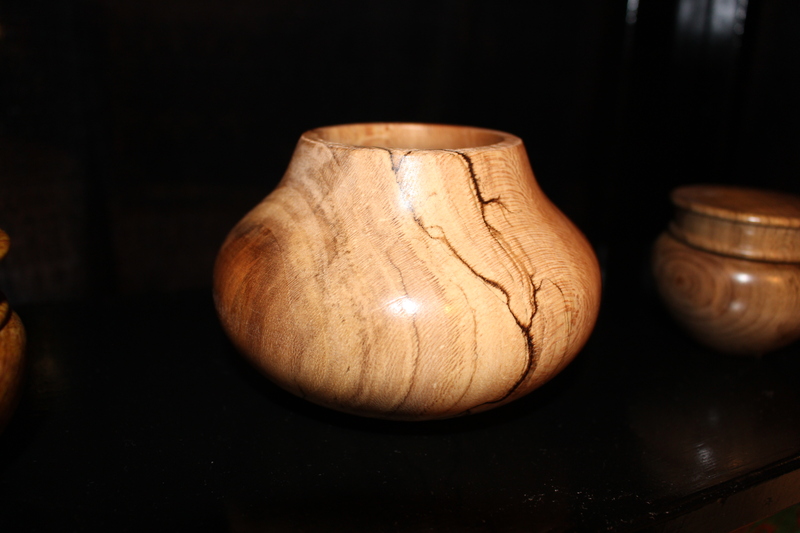 This entry was posted in Destination, Tennessee and tagged Beryl Lumpkin, Bill Henry, Bob Klassen, Charles Pinckney, Fine Craft Show, Foothills Craft Guild, Jane Longendorfer, Kitty Garrett, pottery, Sam Venable, woodturning. Bookmark the permalink. Rusha, Thanks for connecting all of us with art inKnoxville. Thanks, Lana. But going to art shows is a treat for me! Soooo much creativity in Knoxville! Fantastic post. It was very interesting to see which kind of craft man makes abroad. High quality, I can say. My wife used to quilt and now she beads. Thank You for this great post. I hadn’t thought about Steam Punk, but you are absolutely right. So glad to read that you are a quilter. My mom was also, and now I have an unfinished one that she left me! So, I may be a quilter, too, by default! The stitchery lady had a GREAT booth! Thanks for supporting the guild Rusha! You are so welcome! The show was wonderful, and it’s great to have it in Knoxville! Thanks for reading and commenting! Amazing work. I loved reading about each and every one. Wish I could have photographed the whole booth! It was almost surreal! Thank you so much for the wonderful review of our show this year! It’s always a pleasure being in the show and meeting so many great art lovers. I glad you liked it. Loved the show and glad you like the blog! Thanks for reading and commenting. May your holiday season be bright!